Go on, take a look at some of our favourite plugins, ads-on, code snippets and bits and pieces. We’ve listed the ones we love, recommend and use regularly ourselves. We’ll add to this as we get time and while this is by no means a full extensive list, we hope you find something that’s helpful. Remember, sharing is caring. We love type, and we love websites. Here’s how we keep websites looking great and putting great looking content in front of your customers. Serious, professional, classical and modern fonts. With many of the big names, Typekit is a great way to get fully licenced fonts onto your website. A must when working with corporate businesses and strict style guides. Just because it’s free, that doesn’t make it good. Yeah, there are some “not so great” fonts on Google Fonts but there are some real gems too. A great way to add some personality to your site. Talking about Google Fonts, Skyfonts is one of the easiest ways to install and manage Google Fonts onto your computer. Well worth a look. We love WordPress, but we love to keep things lean and mean. Nothing is worse than a bloated slow loading site, so here are out go to Plugins & keep head over here if you’re looking for more WordPress Plugin tips. Without a doubt our most used plugin. Advanced Custom Fields allows you to extend your WordPress pages, posts and templates to create custom and flexible layouts and more. Replace many bloated plugins with this simple solution, and read how we use ACF in our basic custom Page Builder tutorial. Our go-to for WordPress security. Tighten up your WordPress site and keep it safe. Combined with Backup Buddy its a powerhouse solution for website safety and security. When we need to use a slideshow or carousel, whether its image sliders or testimonials we head straight to Owl Carousel. It’s lightweight, super fast loading and perfect for Mobile. Fancybox is our go-to for any image gallery. Support for video via youtube and Vimeo a real solid solution for mobile and website image galleries. Communicate directly and easily with your customers, live web chat, bots, email marketing and user analytics with one handy tool. Build responsive, graphical HTML emails quick and easy with BeeFree. Yeah, it’s the little things that make all the difference. 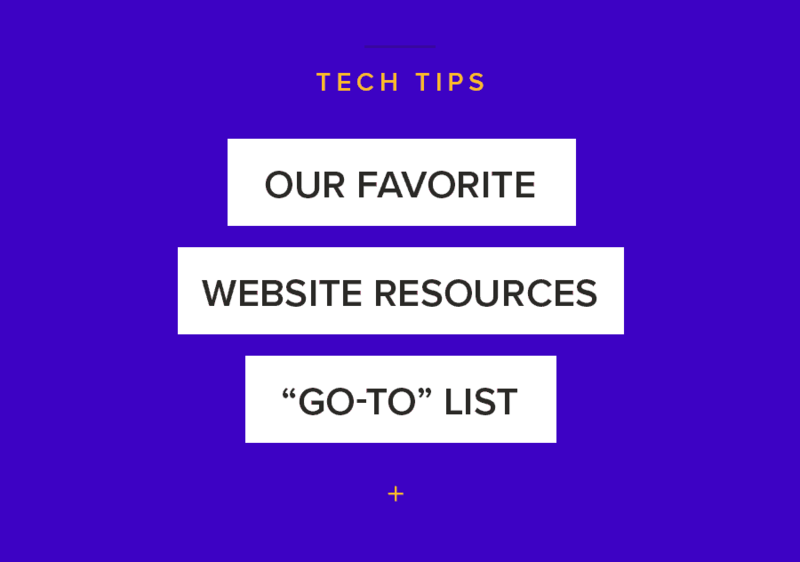 Here are a few of those “bells and whistles” to give your website that extra edge. A great way to make your GoogleMaps have a touch of colour and personalisation. Keep your maps “on brand” and customised. You’ll want to developer API key to hook into, but the results are great. This is still the easiest way to add some movement to your static website. Make things pop and animate to give your site some visual interest. CodePen is simply a playground for designers and developers to experiment and share code snippets and ideas. We’ve not listed any photography and stock image websites, but if you want to find some, take a look at our post on design resources.